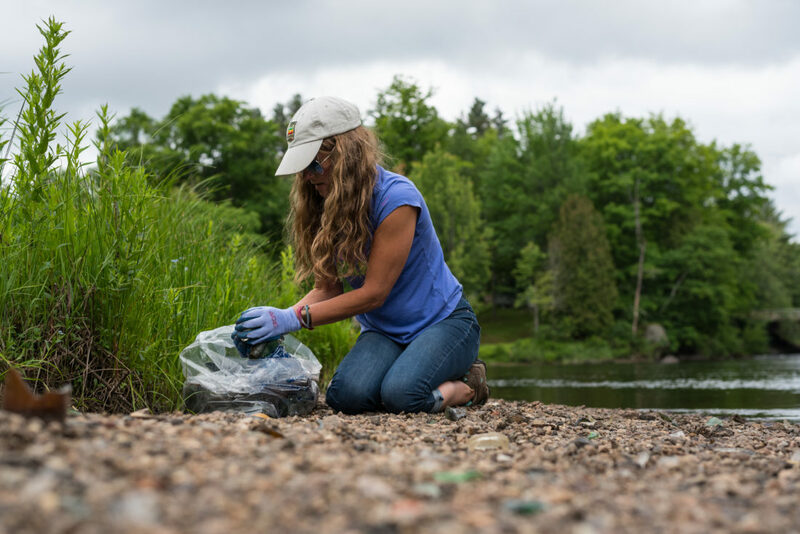 SARANAC LAKE — Despite lack of sunshine and a threat of heavy rain, volunteers came out to support the Saranac River Clean Up Sunday. Guide Nick Brainerd, who also manages St. Regis Canoe Outfitters, and Tyler Merriam of Adirondack Lakes and Trails organized the river clean up. 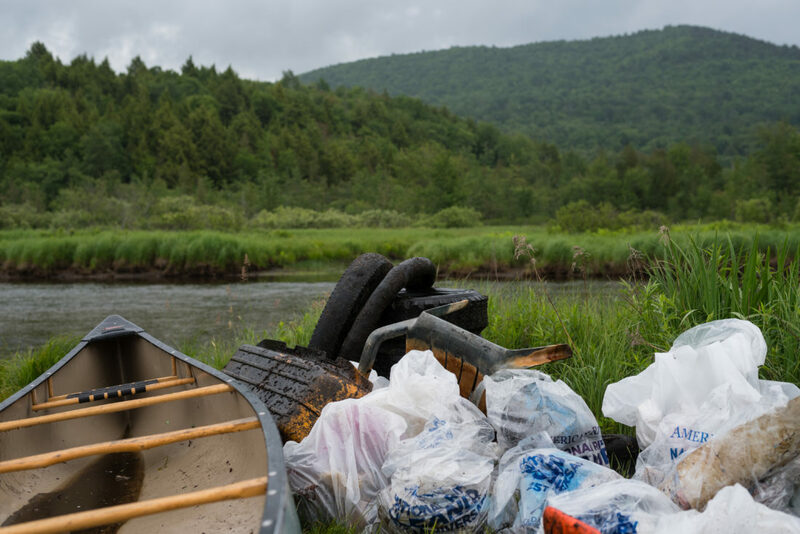 Additional support in the form of trash bags, work gloves, canoes, paddles and barbecue food came from Wiley’s Flies and the Northern Forest Canoe Trail. 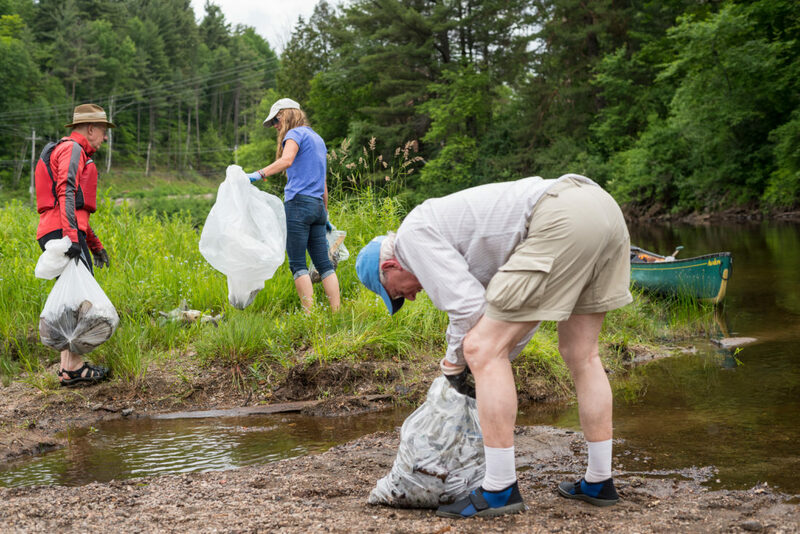 More than 15 volunteers — including residents, local Adirondack Mountain Club chapter members and the Village Improvement Society — paddled 2 miles from the Dorsey Street parking lot to a state Department of Environmental Conservation dumpster at the Saranac Lake Fish and Game Club while picking up trash out of the river along the way. 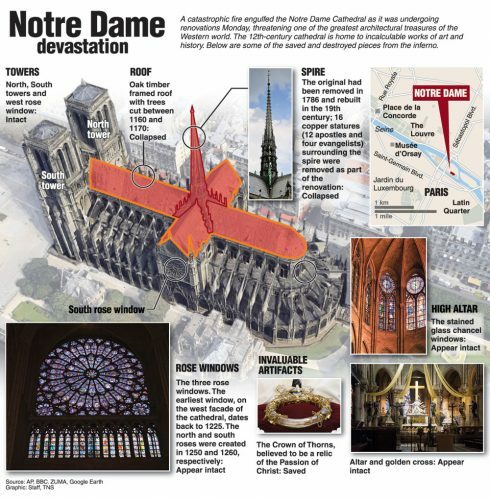 The cleanup originated several years ago but eventually lost organizers and coordination. 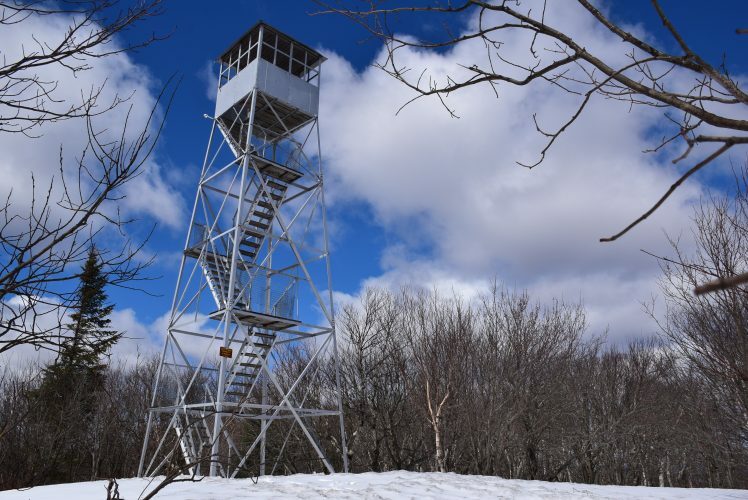 Brainerd and Merriam decided to step up in 2016 to bring the event back to Saranac Lake after a few years without a coordinator. Prior cleanup years lucked out with blue skies and sun, bringing more than 20 people to hit the water. This year’s rain and clouds may have kept some from joining the event, but more trash than previous years was pulled out of the river. 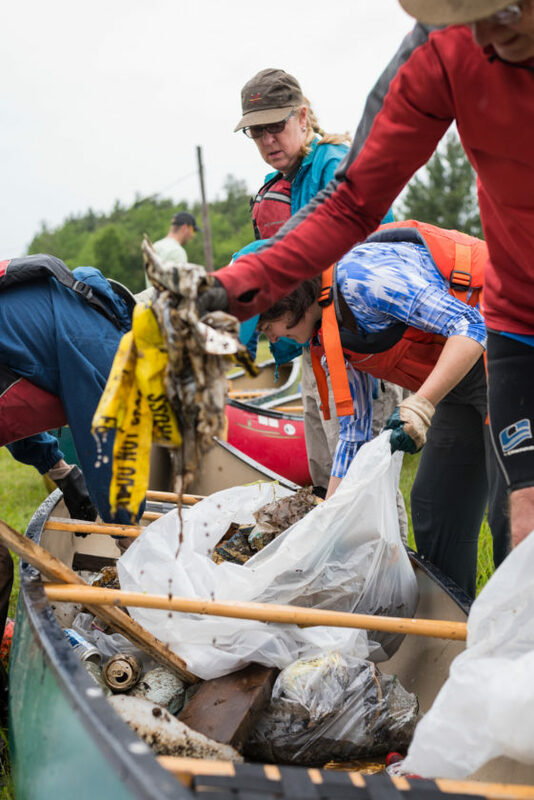 Car tires, countless glass and plastic bottles, shoes, bicycles, fishing bobbers and more were all found in volunteers’ canoes and trash bags at the day’s end. Water levels were much higher during last year’s event. This year, however, more garbage could be found because water levels were lower. One island just after the Pine Street bridge was completely underwater in 2017. But on Sunday, the island was a mosaic of different colored broken glass bottles, meaning more trash from the river could be taken out. 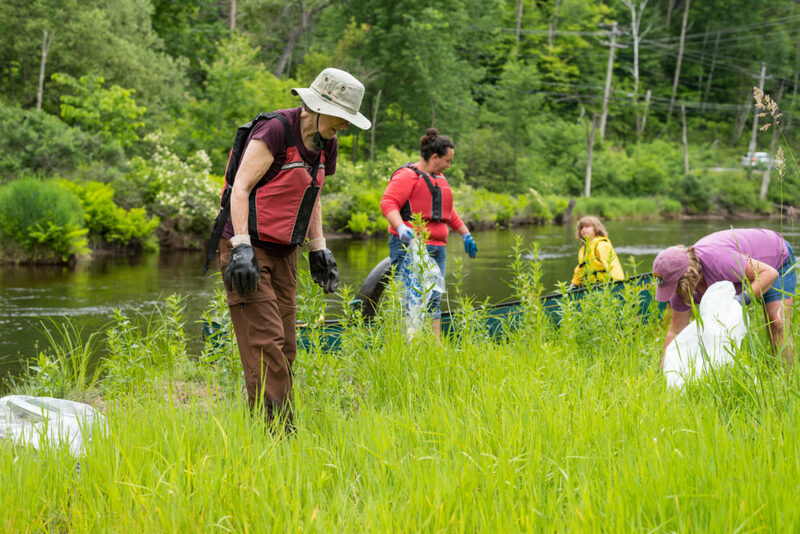 Although mainly an environmental event, the Saranac River Clean Up was also great for community bonding. Lake Placid resident Jessica Bosco brought her son Narayan to join in on the fun.